High Speed (4 minute working time) Sets hard and fast. For setting wood,metal, china, plastics and glass. Use where extra strength is required across gaps. Special modelling PVA that contains no fillers. Superior to many PVA glues. Has unique solvent chemistry for faster drying. 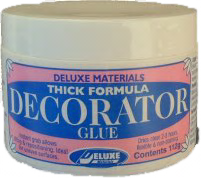 ..Thick glue, which like tacky glue dries clear overnight. It has instant stronger hold round corners whilst allowing repositioning. Very sticky glue that drys clear, flexible, and is non staining. Use for bonding fabric, plastic windows, bonding ceramic and flexible tiles. ..Wax adhesive for holding miniature ornaments etc in place . Allows repositioning. Ready-mixed paste that dries clear. Non staining and does not attack copper wires or tape. sets 1 to 5 sec. sets 5 to 10 sec. sets 10 to 20 sec. A re-meltable one part resin that pours, flows and sets as you want it. Best suited for small liquid projects eg. 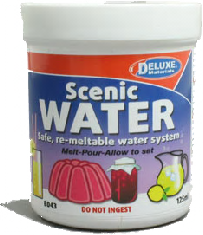 simulating drinks, or water in sinks and baths, bubbles, and many food items including jellies. Melts at around 60°C. 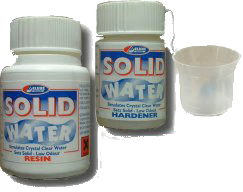 A low odour, 2 part resin for simulating crystal clear water for miniature bowls, garden ponds, puddles etc. Creates the illusion of deep water with minimal thickness. 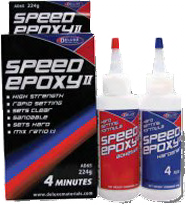 Invisible, non staining flexible adhesive that inhibits the fraying of fabric when dry. Non sticky and easy to sew through when dry. Works on all fabrics. Does not bleed through or leave a watermark.